Wednesday 17th September 2014 – 7.40am – Claire Brown. A cyclist and a car driver have been taken to hospital following a road traffic collision in a Herefordshire village yesterday rush hour. West Midlands Ambulance Service was called to Mordiford, just north of the villages’ primary school on Dormington shortly before 6.00pm last night (Wednesday). Two ambulances, a paramedic area support officer and the Midlands Air Ambulance from Strensham were sent to the scene. A BASICS doctor came across the incident and stopped to help. A West Midlands Ambulance Service spokeswoman said: “It was reported to ambulance crews when they arrived on scene that a van and a car had been in collision. 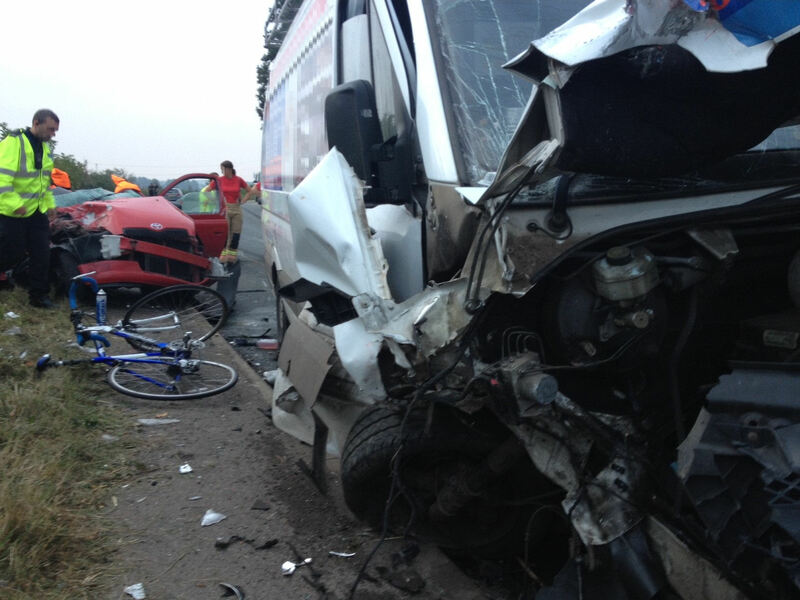 Immediately after the collision, a cyclist went through the scene and subsequently collided with debris. “The driver of the car, a woman, was trapped in the vehicle and had sustained a head injury and arm injury in the collision. Ambulance staff administered pain relief to the woman to stabilise her condition whilst the fire service worked around the medics to carefully release her from the wreckage. Once extricated, the woman was immobilised with a neck collar and spinal board before being taken by land ambulance to Hereford Hospital. “The cyclist sustained a nasty hand injury and deep lacerations to both legs and right arm. Ambulance staff dressed the cyclists’ wounds before conveying them to the same hospital for further treatment. Next Entry Would you recognise a stroke? Brin was glad that his wife did!